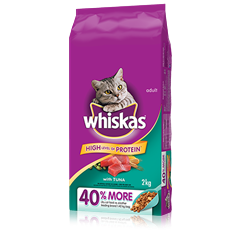 We know that cats' needs change as they age and that's why we've developed a formula specifically for senior cats over the age of 7. This formula contains Omega 3 fatty acids to help support joint health and a blend of antioxidants to help support a healthy immune system. 100% Complete and Balanced with the great taste of delicious real chicken - it is everything your senior cat needs. 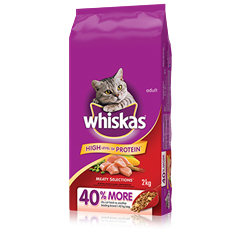 WHISKAS ® Senior Formula with Chicken is rated 3.0 out of 5 by 1. Rated 3 out of 5 by lapchit from My cats love it. My cats enjoy this food but I really wish it came in larger bag sizes. The 1.5 kg bags don’t last long when you have multiple cats. Are larger bags in the future? CHICKEN BY-PRODUCT MEAL, CORN GLUTEN MEAL, GROUND YELLOW CORN, ANIMAL FAT (PRESERVED WITH BHA AND CITRIC ACID), SOYBEAN MEAL, NATURAL FLAVOUR, BEET PULP, CHICKEN, WHEAT FLOUR, RICE, WHOLE FLAXSEED (SOURCE OF OMEGA-3 FATTY ACIDS), POTASSIUM CHLORIDE, SALT, VITAMINS (CHOLINE CHLORIDE, VITAMIN E SUPPLEMENT, CALCIUM L-ASCORBYL-2-MONOPHOSPHATE, VITAMIN A SUPPLEMENT, NIACIN, VITAMIN B12 SUPPLEMENT, RIBOFLAVIN SUPPLEMENT [VITAMIN B2], THIAMINE MONONITRATE [VITAMIN B1], d-CALCIUM PANTOTHENATE, VITAMIN D3 SUPPLEMENT, BIOTIN, PYRIDOXINE HYDROCHLORIDE [VITAMIN B6], FOLIC ACID), VEGETABLE OIL, TAURINE, dl-METHIONINE, IRON OXIDE, TRACE MINERALS (ZINC SULPHATE, COPPER SULPHATE, MANGANESE SULPHATE, POTASSIUM IODIDE), CALCIUM CARBONATE, MARIGOLD EXTRACT (SOURCE OF LUTEIN), BHA, BHT. 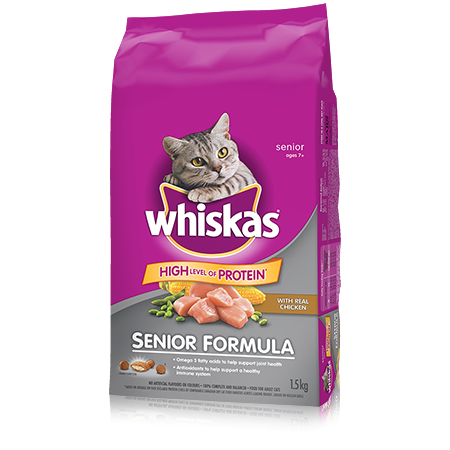 WHISKAS® Senior Formula with Real Chicken Dry Food Formula is formulated to meet the nutritional levels established by the AAFCO Cat Food Nutrient Profiles for adult maintenance.